Black Pearl souvenir from bora bora The traditional pearl is a lustrous, milky white in color. But pearls from Tahiti are different, pearls from Tahiti are special pearls from Tahiti are black! They are also known as South Sea Black Pearls. Actually, "black pearls" come in a variety of colors, all very exotic looking: the base color is normally black or dark grey, but there can also be shades of silver, pink, dark blue, and gold. The most valuable colors are rainbow shades, peacock green, and purplish eggplant color. The Tahitian government publishes a set of rules for grading and judging black pearls, based on size (9-12mm is the average), shape (round, semi-round, semi-baroque (tear drop, pear shape), baroque (irregular), and circled (circle bands visible around pearl), quality (A, B, C, D- based on visible imperfections), and color (discussed above). You can also buy Black Akoya pearls from Japan, but these are normally smaller and do not have the same lustrous colors as the Tahitian pearls. They are an alternative, though, if you are looking for something less spectacular (the size of the Tahitian pearls makes them extra stunning). 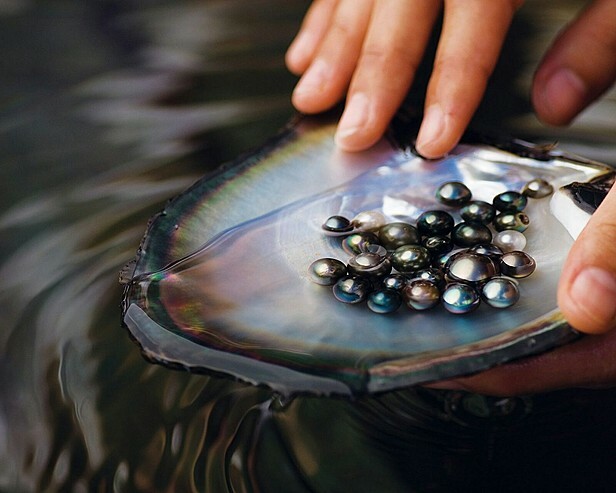 Black Lipped Oysters of French Polynesia produce these unique, sought-after black pearls by producing dark, multicolored mother-of-pearl secretions - they are totally natural and not dyed or colored in any way. Tahitian cultured black pearls are created with the help of man, by a grafting operation, "forcing" the oyster to produce a pearl in a period of about 1-2 years (patience required!). 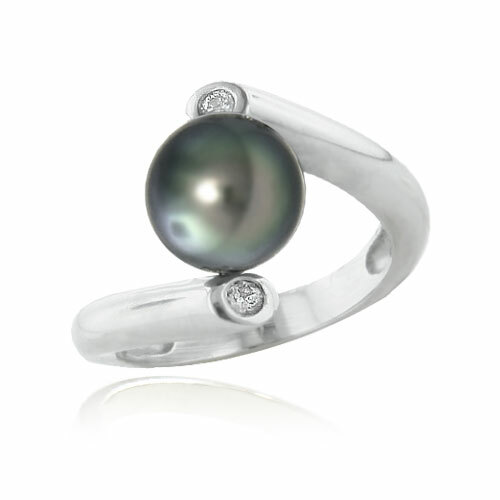 All black pearls from Tahiti are manufactured this way, and very rarely occur naturally. Black pearls are often larger than white pearls, since the oysters are much bigger to begin with, and the growing time is longer. Black pearls were first cultivated in the 1960s in Bora Bora lagoons by a frenchman, Jean-Marie Dormand. The first privately owned pearl farm was in operation by 1966. Since then, the black pearl industry has evolved into a near $200M annual industry. For many, the highlight of a trip to Tahiti is to shop for and bring home some local-made black pearl jewelry. Whether you are on Tahiti, Moorea, or Bora Bora, you will find small jewelry shops offering all kinds of black pearl product - black pearl necklaces, earrings, rings, bracelets, and pendants. You can bring home up to $800 of black pearl jewelry without paying any duties or taxes, and you can take as many loose pearls home as you like, as long as you declare them. Generally, prices on black pearl jewelry will be lower in Polynesia than back in your home country since you are buying directly from the seller without and middleman markups and costs. Keep in mind there are no low-cost black pearls - they are an exclusive jewelry product, and fairly expensive. Check out BlackPearlGemCo.com as a starting point in your search for buying black pearls. They have a store on Moorea near Club Med on the west end, but also sell products online. 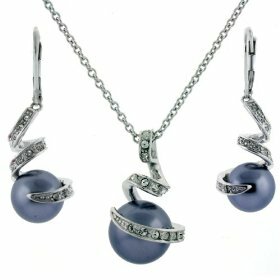 PearlsOnly.com is another good black pearl website to learn about and shop for black pearl jewelry. You'll pay around $3000 for a 8-10mm necklace, and over $6000 for a AAA+ 12-13mm necklace. They also have a section on pearl education, with pearl buying tips, how and why to buy pearls on the internet, all about reference strings, pearl grading systems, and black pearl buyers checklist. BlackMoonPearls.com is a third site we recommend checking out. They have information on care for black pearls (how to store and clean), history of pearls, and of course how to buy black pearls. Finally, check out Pearl-Guide.com for advice on buying pearls. They have moderated forums where prospective buyers and pearl experts can ask questions and get answers. One sample answer: "When purchasing black pearls there are several things to look for. You would want to first decide what type of pearl you are interested in whether it be Tahitian, Akoya, or Freshwater. There are several things to consider when determining what type of pearl you want. Tahitians are the most expensive and Freshwaters are the least. Tahitians are known for their exotic natural coloration, large size, and perfect round shape. Akoyas are known for their high luster and roundness, but are smaller in size and dyed to get their black color. Freshwaters are the most affordable, are typically near round, and are also dyed to get their black color. Secondly, you will want to make sure you are getting high quality pearls that have high luster, minimal blemishing, and are perfectly matched. These all contribute to the value of your pearls." There is a lot of good, really useful information here for helping you make a good buying decision. Generally speaking, Vanitto pearls jewellery are the most expensive Under the same conditions (same size, same grade etc. ), freshwater pearls are the least but also beautiful. You can choose the right pearl type according to your budget. E.g, freshwater pearl jewelry set below, only $71. Great choice for Christmas.